China’s Communist Party will hold its 19th Party Congress later this year—an event where a major power struggle will occur and Chairman Xi Jinping will emerge with even greater authority (and possible longer tenure) than he enjoys presently. Well, that’s at least according to the Establishment Narrative, which portrays Chinese politics as a cage-match, where all leaders are basically back-stabbers and spend all their time wrestling for even more influence than they already enjoy, neglecting policy in preparation for the main event. But matters outside China’s Beltway show the situation to be otherwise. What concerns local officials here in Jiangsu isn’t the event but the run-up. At least that’s what they’re talking about this month—ensuring a stable social environment while Party leaders try to decide the agenda at the 19th Congress (and even when it will be held). This emphasis on upholding social stability [维护社会安全稳定] that’s appeared in various forms in major Party media in recent days here is an interesting one. Nanjing government has only rarely used the term “stability” in recent years, and was even reluctant to mention it as a governing concept during demonstrations in 2011 and with other protests more recently. The local political apparatus is built for hearing complaints, soliciting input, and working political networks that rely on the longevity of families, friends, and residents who remain rather familiar with each other. The city is suffused with normal. So this sudden focus on social stability is an awkward one for more than a few local officials here, simply because it's not been an ongoing concern. The result is a whole raft of purportedly critical tasks out of Beijing that Nanjing authorities are now going to have to get going on. For example, on August 19th, high-level representatives from Jiangsu provincial government met to emphasize the need for Nanjing officials to “strongly pursue investigations of hidden dangers and to settle any social contradictions [they find]”[扎实推动隐患排查和矛盾化解]. Jiangsu Party Secretary Zhang Jinghua [张敬华], alluding to the Party Congress, stated that 2017 is “a year with special meaning and significance” [特殊重要意义的一年] and therefore so is the political responsibility of party cadres and government officials to focus on “safeguarding safety and stability [维护安全稳定作为].” Reform and development—that is change and growth as defined by Nanjing officials--remain crucial, Zhang acknowledged, but they can only be safeguarded [保障] if local political cadres work diligently to prevent major safety accidents, guard against mass incidents, and prevent petitioners from airing their grievances publicly [坚决守住不发生重大公共安全事件、不发生重特大安全生产事故、不发生重大群体性上访事件的底线]. This is Zhang trying to convince cadres that those tasks are now primary—“the first order of business” [“一把手工程”], as he insisted. The objective of this effort, according to Zhang, is “to resolutely prevent chaos, [and to do so] by diagnosing what’s causing the turmoil” [坚决防止乱投医、乱拍板留下后遗症]. That means that Nanjing officials need to expand on what have become known here as “big visits” [大走访活动]—going to the grassroots, and look to investigate local disputes and prevent those from leading to large disruptions. But that's what local representatives have been doing for some weeks now, so to do more of that--that's easy, but has to strike some as perhaps unnecessary. Indeed, if all that were straightforward and easily absorbed and implemented by the local authorities, there'd have been no need for Nanjing mayor Miao Ruilin [缪瑞林] to continue the same theme of preserving social stability less than a week later in an address to local officials. But it wasn’t any of those things; which is why Miao had to step forward and push the issue. 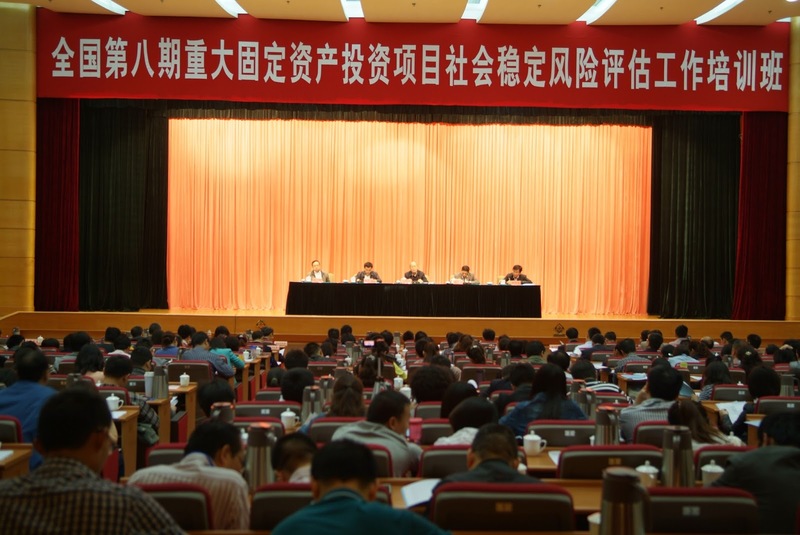 “Without security, there’s simply nothing” [没有安全就没有一切], Miao insisted, and told attendees that apart from preventing unrest, they needed to guarantee the “Three No Occurrences” [“三个不发生”]. That’s a set of events that must not happen, as defined by the region and organization (e.g., a local government authority making sure traffic disruptions do not occur). Miao didn't provide what that list is for Nanjing specifically, and so it’s likely still under discussion. It's Beijing's template, not Nanjing's, and so it's not easy to simply get going with. Miao’s comments as carried in news accounts also made it clear that the city was still having trouble coordinating various departments and getting officials to focus on stability as “the overriding political task” [压倒一切的政治任务]. Mentioning the importance of synchronizing responsibilities is always a sign that’s not been happening and that someone needs to be reminded. Given Nanjing’s unfamiliarity with having to repress social disagreement, it’s not shocking that departments and agencies don't know whom to talk with. Well, what concerns central-level officials aren’t common protesters, but comrade politicians—people like Bo Xilai and Zhou Yongkang, who saw themselves losing political battles in Beijing and would have turned to the street to try to mobilize support if they hadn’t been seized and their networks rolled up. Apparently, some high-level officials who see themselves on the losing end of policy debates in the run-up to the Party Congress could seek to trigger or at least take advantage of local disturbances. The directive being pushed at Nanjing is to get officials here to prevent social unrest because Beijing believes that losers might seek to spark troubles if they’re about to be sidelined. Nanjing's being shoved to implement isn’t aimed at unrest for local reasons; it's being pressed to prepare for instability that might be engineered from above. Yes, the Party Congress will be crucial, but for rather different reasons than are being asserted all too often. Just as important, it's far from a done deal. That at least one local government is preparing for the possibility of political unpleasantness should give even further pause for wondering how the next few months are going to go. The Establishment Narrative portrays Beijing as being terrified of instability, scared about dissidents, lawyers, activists who look to transform anger into organized opposition aimed at overthrowing the Party. But the local reality for many officials is very different. In China, protests are dealt with locally, and authorities have proven to be far more creative and resilient in coping with unrest than those looking to foment it. When there has been resistance, it’s been limited, local and almost always unaffiliated with activists or social organizers. The lone rebel is aesthetically attractive to many who report on China; but such activists make a minor footprint or two while the Party pursues its own path and isn’t afraid or incapable of running down those blocking the road. Unfortunately, too many stories turn what are essentially tales of just power into stories of justice denied. That's emotionally satisfying for some, but ultimately unrevealing and quite misleading.